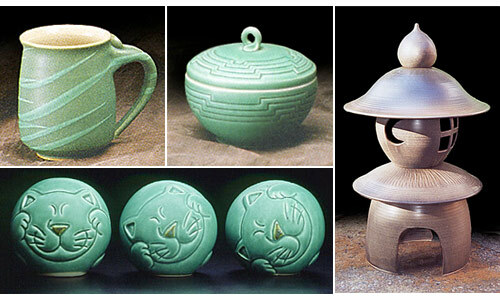 In Sonoma County, California where we reside, we have become aware of a number of excellent ceramicists. We try to make a point of visiting the Nichibei studio every time the local ARTrails comes around. 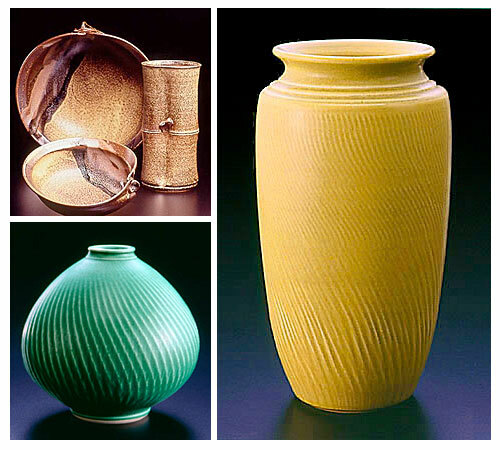 Their studio atop a bucolic hill in Sebastopol is a showcase for their modern take on traditional Japanese pottery. Mikio Matsumoto & Cheryl Costantini formed Nichibei in 1985. Their elegant creations include classically formed vases with delicate details of spirals, dragonflies, or leaves, mugs perfectly formed to fit your handgrip, Japanese-style garden lanterns, perfectly proportioned bowls, porcelain animals and dinnerware. To see more of their work, please visit the Nichibei’s Web site at www.nichibeipotters.com. For locals, we highly suggest that you pay a visit to the Nichibei studio. They open their studio twice a year during the Sonoma ARTrails. There is an Annual Holiday Open House coming soon on December 13 and 14. Mark your calendar. Talented photographer Gayle Ketzel has an intriguing collection of photographs of birds, particularly crows. Working out of Seattle, Washington, Gayle has become very fond of the plentiful Northwest crows. She worked out a process of shooting digitally through the viewfinder of a vintage camera that creates an otherworldly, cinematic quality to her photographs. 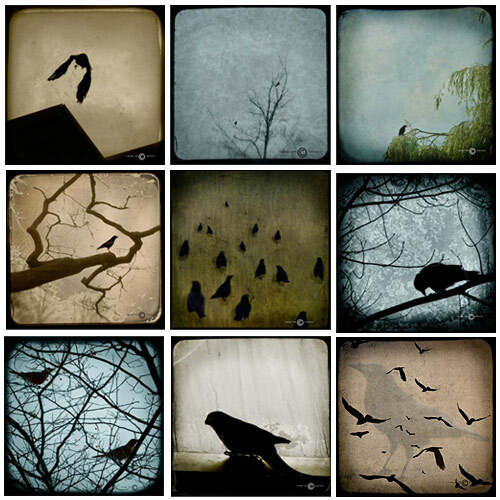 We picked out a selection of her spooky crows that put us in a Halloween mood. Please visit Ketzel’s online store to see more. As autumn approaches, leaves falling all around, it leaves us longing for the new breath of spring time. 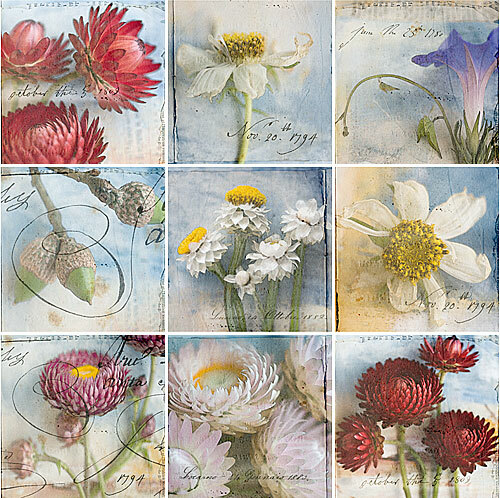 When we saw the recent creations of Thea Schrack, we felt alive with the renewal of spring again. Thea Schrack’s latest works have gone in a new direction. Inspired by flowers found in her weekly farm basket, some as small as a little fingernail, Thea has intensified her attention to detail with these exquisitely crafted pieces. Thea referred to this series as "Slow Flowers," like the Slow foods movement – a way of living and eating, good for the people and the planet. One could also see it as slowing down to experience all the small details in nature’s gifts. Alan Mazzetti is showing his most recent series at the Art People Gallery in San Francisco this month. Read the following to get a feel for Alan's thought processes and inspirations behind Particles. I’m very excited about this new series – Particles. It’s an evolution of the themes I was working with previously: showing changing relationships by depicting matter and energy. 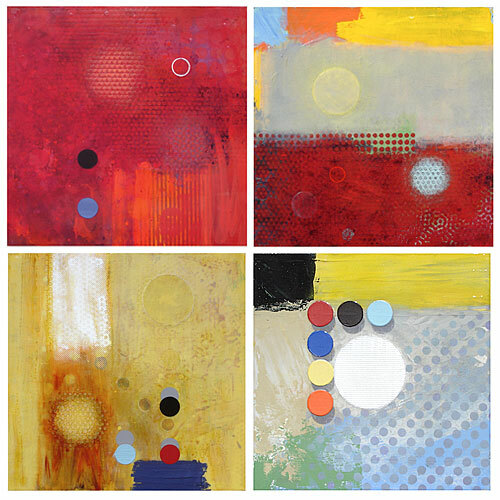 Within each painting, you’ll see different relationships between the circles: they’re single and in groups; they change scale; some are flat, some dimensional; some are mathematically precise while others are organic and accidental. That’s why I use circles as an icon – it’s elemental enough to stay true through these different incarnations. The big difference technically – and visually – is that I previously started with a digital transfer of my circular icon representing matter and energy. Replacing that is what I call an event – a circle made of smaller circles that suggests a dimensional object and simultaneously a reflective light source. In addition to the changing relationships within the painting, each one is composed so that you can change the way it hangs. Every new orientation will emphasize different elements within the piece and change your perception of it. You continue the creative process begun in the studio. I think one of the most important functions of art is to encourage us – both the artist and the viewer – to see things in new ways. These paintings are meant to continually change your perspective. Visit Alan Mazzetti’s Web site to see more. Pippijoe’s limited edition screen-printed fabrics – designed and hand screen-printed in Melbourne, Australia. Caitlin, the creative hand behind Pippijoe, is an independent designer with a background in interior design and landscape architecture who has ventured into hand screen-printed textiles. Caitlin’s inspiration usually comes from nature, and the help of her one and three year old children. 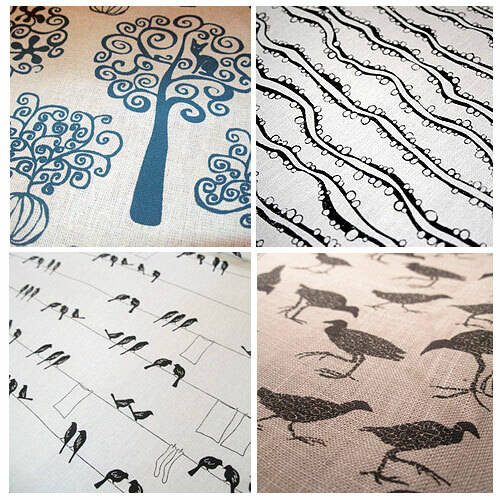 All Pippijoe’s fabrics are printed on natural fibres (hemp and cotton) with environmentally friendly inks. Creative artisans have made interesting household products and accessories by using Pippijoe fabrics. Please visit Pippijoe Web site to explore more. Alan Mazzetti will be showing his most recent works at the Art People Gallery in San Francisco, California. One of HaveMuse’s featured artists, Ivy Jacobsen will be showing her works at Artspan’s Open Studios Exhibition in San Francisco, California. We found Ivy Jacobsen's arts at the Hunters Point Ship Yard open studio. 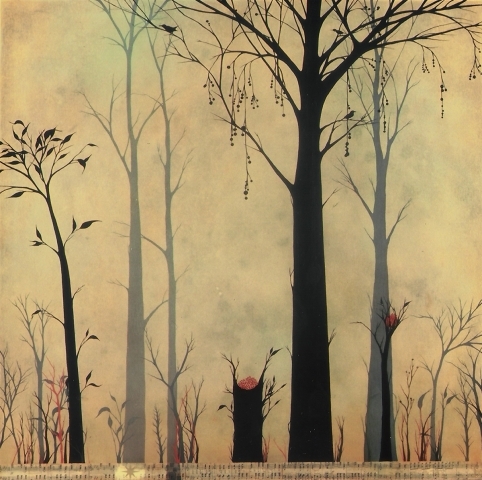 Since then, we have been visiting Jacobsen's Web site and continuing to admire her art. Shown above is one of her recent paintings, titled "Finding Home in a Tree" – private collection, 36×36", oil, bronzing powder, & mixed media on canvas.